Airbus Defence and Space completed the maiden voyage of its first production aircraft within the Zephyr program, the new Zephyr S HAPS (High Altitude Pseudo-Satellite). After taking off on July 11 in Arizona, Zephyr S logged a flight of more than 25 days, the longest duration flight ever made. An application has been made to establish this as a new world record. This maiden flight of the solar-powered Zephyr S, explains Airbus, proves system capabilities and achieved all of the flight’s engineering objectives. The previous longest flight duration record was also logged by a Zephyr prototype aircraft a few years ago, achieving then more than 14 days of continuous flight, which already was 10 times longer than any other aircraft in the world. This new record flight was supported by the UK government and, explains Airbus, reflects the UK Ministry of Defence’s position as the first customer for this innovative and potentially game-changing capability. 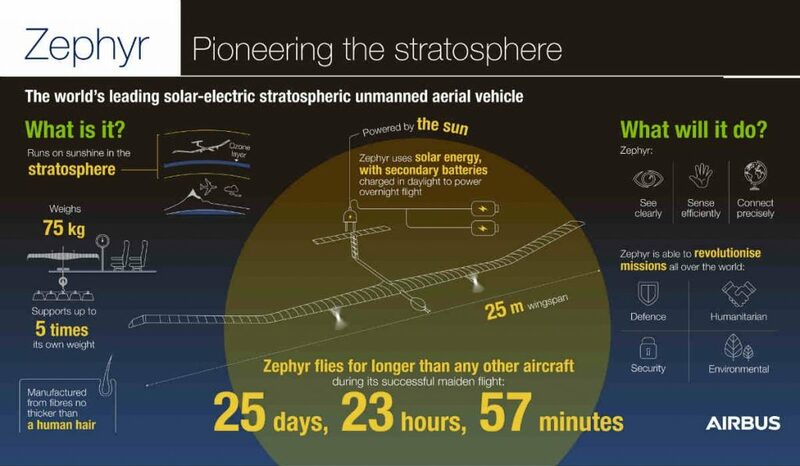 Zephyr is a solar–electric, stratospheric Unmanned Aerial Vehicle (UAV). It harnesses the sun’s rays, running exclusively on solar power, above the weather and conventional air traffic; filling a capability gap complimentary to satellites, UAVs and manned aircraft to provide persistent local satellite-like services. Airbus explains Zephyr is designed to bring new see, sense and connect capabilities to both commercial and military customers. Zephyr holds great potential to effect disaster management, including monitoring the spread of wildfires or oil spills. It provides persistent surveillance, explains Airbus, tracing the world’s changing environmental landscape. It can also provide communications to the most unconnected parts of the world.